Start profiting from the powerful combination of Exchange-Traded funds and independent, up-to-date investment advice with a subscription to Carl Delfeld’s monthly ETF investment eNewsletter and his 7 Model ETF portfolios. 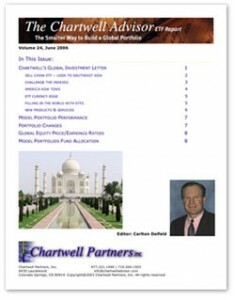 The Chartwell ETF eNewsletter is your guide to the world of ETF and Global investing. You’ll receive 12 issues of Carl’s global ETF investing newsletter to keep you up-to-date on the latest investment news effecting ETFs and the global market.